Giuseppe Laudati was born in Corciano, to a family that also enjoyed citizenship of Perugia. he trained in Perugia under Pietro Montanini, and then studied in Rome. Eleven of his works survive in Corciano, including eight in the Museo della Pievania “Giuseppe Laudati” there. This panel by Giuseppe Laudati on the right wall of the Cappella di San Lorenzo, San Domenico came from the Cappella del Rosario there. It is based on a panel (1593) by Annibale Carracci in San Francesco, Bologna. The panel on the altar of the Cappella di San Pio in San Domenico is by Giuseppe Laudati. It depicts Pope Pius V placing dust from the site of the Circus of Nero into a handkerchief offered by his companion, the Polish ambassador. When the ambassador later opened the cloth, the dust had been transformed into the blood of martyrs. ✴the mystical marriage of St Catherine of Siena (on the right wall). 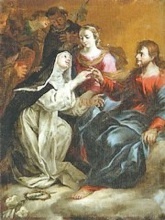 The painter of another panel of mystical marriage of St Rose of Lima on the left wall is unknown: it is dated by inscription to 1739, two years after the death of Giuseppe Laudati. This altarpiece by Giuseppe Laudati on the high altar of San Giovanni di Dio (the church of the Ospedale di San Nicolò degli Incurabili) depicts the Virgin with St John the Evangelist. The Virgin holds a crown of thorns over the head of St John of God, who kneel before an altar. ✴St Stephen Abbot welcoming St Bernard to Citeaux in 1113. The panels have recently been restored and are now in the corridor above the cloister of the ex-nunnery.